Infantry formations of the Liberation Tigers crossed the Verugal River, about 78 kilometres north of Batticaloa, in the early hours of the morning Friday and advanced towards Vakarai, residents from the area who arrived in Valaichenai said. The infantry formations of the LTTE were spearheaded by crack commando units of the LTTE and were backed by heavy artillery fire. Karuna Group commander for the Vakarai region, ‘Jeyam’ was wounded. LTTE infantry and mortar units are consolidating their position in Paalchenai, about 6 kilometres north of Vakarai, according to residents of the area. More than three hundred young fighters of the Karuna Group who were defending the southern side of the river and the interior surrendered without fight, sources said. They would be handed over to their parents soon, a resident said, quoting an LTTE commander who led one of the advance teams that crossed the Verugal River. Several heavy mortars too were surrendered by the Karuna Group units north of Vakarai. A large sea side base of the Karuna Group in Kathiraveli, about 12 kilometres north of Vakarai, fell to the advancing LTTE infantry formations without much resistance, sources said. The Kathiraveli base of the Karuna Group was under the command of 'Maarkkan'. His fate was not known. Meanwhile, sources said that ‘Reggie’, (Mr. Vinayagamoorthy Sivanesathurai) the elder brother of renegade LTTE commander ‘Karuna’ and who was in overall command of the region north of Valaichenai – from Mankerni to Verugal – escaped the daybreak assault. Residents said he arrived in Vakarai village later in the morning. About eight fighters were reported killed on both sides. Medical sources in Valaichenai, 32 kilometres north of Batticaloa, said that seven wounded cadres of the Karuna Group were brought to the hospital there for treatment. Two died on arrival at the Valaichenai Hospital. 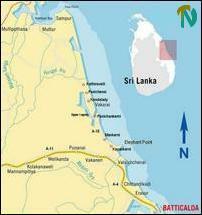 The five wounded were then rushed to the Batticaloa hospital, medical sources in Valaichenai said. Eight Karuna Group cadres, 5 females and 3 males, wounded in the fighting in the Vakarai area have been admitted to the Batticaloa Hospital, medical sources in the eastern town said.